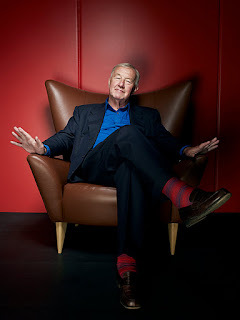 I've never been a particular fan of Terence Conran. His well-fed, cigar-smoking (five a day, apparently), bon viveur persona – not to mention his ubiquity – hasn't ever sat too comfortably with me. But I might have to revise my opinion. Meeting him a few days ago at a dinner for his 80th birthday, I got a fascinating glimpse into his personal world, and a new-found appreciation for what he's done for British lifestyle. He set up a furniture, ceramics and textile workshop in the East End of London in the late 40s, and worked on the Festival of Britain exhibition in 1951. But his first big public venture was The Soup Kitchen in 1953, a little restaurant just off The Strand. Inspired by trips to France, he served unimaginably exotic wares to a British public still on rations: espresso, French bread and cheese, and soup. Served in mugs! Inside were cane chairs and a quarry-tiled floor. Conran founded Habitat in 1964 and revolutionised our homes. It sold colourful, exotic furniture and homewares – duvets, woks and Japanese paper lanterns – to that hip young generation, a world away from their parents' heavy, pre-war furniture hand-me-downs. The rest – design shops, divorces, a restaurant empire and designer offspring – is history. At dinner, he was surrounded by women who had clearly been extremely beautiful in the 60s and still had that decade's tousled, blonde hair and smoky eyes; and dapper, old-school gents, in whom you could still detect a touch of the East End barrow boy. I sat next to one, Roger Mavity, chief executive of Conran's holding company – unconventional, twinkly-eyed and with a cracking humour. He refused to take the quiz that had been laid on for us seriously, unlike the rest of the room – "It's a bit of a conversation killer, isn't it?" – and regaled me with stories. I was utterly charmed. 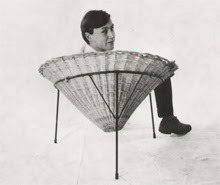 Conran, like many of his generation, hates waste of any kind. He works hard, is famously tight-fisted, and loathes mobile phones and bullshitters (notably Tony Blair and George Bush). In a speech at the end of the night, he might have said a few humble thank yous and raised his glass. Instead, he lambasted the Government, said that now he was 80 he better work harder as there was no time to waste, and made a slightly off-colour joke about cutting staff numbers, before someone relieved him of the microphone. And I admired him all the more for it. Hi Hannah, I was in Milan about a year ago for a British promotion at La Rinascente. There was a press party on their roof terrace and I remember seeing Terence Conran sitting on his own looking quite frail (and most probably bored!) Looking back on it I wish I had been brave and taken the bold step of chatting to him! It was lovely to see this article about him and get reminded of his history.